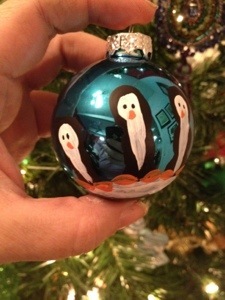 I made these adorable penguin ornaments with my two year old last night. They turned out great. I used black acrylic paint which I poured about a teaspoon of onto a styrofoam plate. I stuck his hand in the paint and then hold out his hand. I placed the Christmas ball in his palm and told him to hold it and then let go quickly. 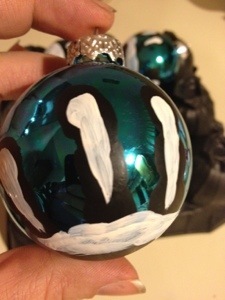 I painted in the white and the little faces. 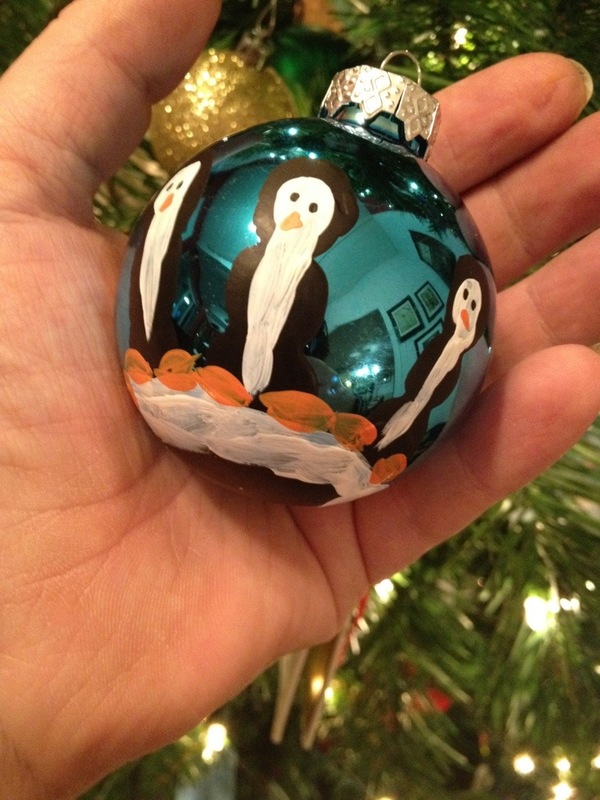 I also put little feet on them and painted a little snow under their feet. These are so cute I can’t wait to share them. 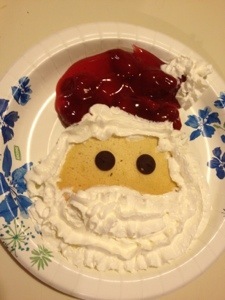 This year we have officially made a tradition by bringing back Santa pancakes. The weekend after Thanksgiving we decorate our tree and that Sunday we kick off our Christmas holiday season with Santa pancakes. We use pie filling (cherry or strawberry) for the red on his hat. Chocolate chips for eyes and whipped cream for his beard and the trim on his hat. The kids love it. It’s a great way to start the holidays! 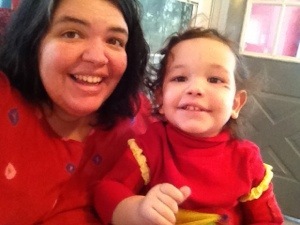 My kids are huge Blues Clues fans. 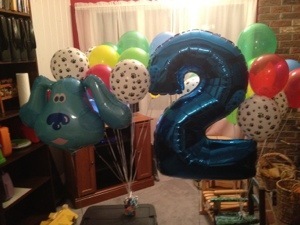 This year for my son Gabriel’s second birthday we decided to make his dreams come true and have a Blues Clues themed birthday. The kids had a blast and the grown ups are still talking about it. I made a Blues Clues cake, a card table Blues Clues house and dressed my kids up as Joe, Blue and Steve. For the main activity for the birthday party I set up a real live Blues Clues game. Each kid got a notebook and a crayon when they arrived. I placed the clues and timed them strategically so that the last clue would come just before cake time. 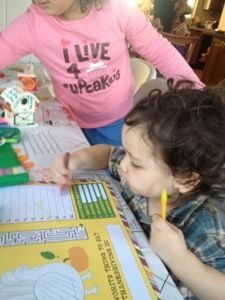 The first clue was a clock, the second was a candle, and the third one was a picture of the birthday boy. The kids loved it. It kept them busy all afternoon. They couldn’t wait to set up their own game when the game was finally done which led to even more fun. I kept the menu kid friendly and easy. Home made Mac and cheese with stir ins broccoli, peas, tiny hot dogs, and corn was the main meal. To keep the grown ups happy I served vanilla pear cocktails. Fun was had by all. 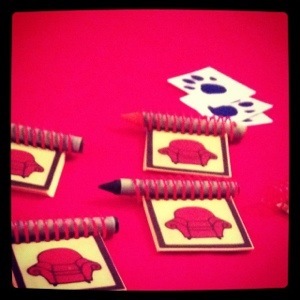 Blues clues notebooks come in party packs. People make them at home on their printers and sell them on eBay and Etsy. I paid $20 for a dozen notebooks and crayons. 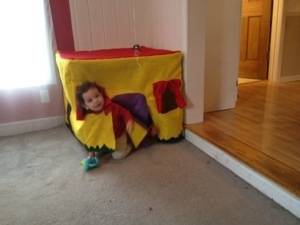 I made the blues clues house out of felt and used a hot glue gun to put it together. I used the measurements of my table to determine the measurements of the tops and sides. 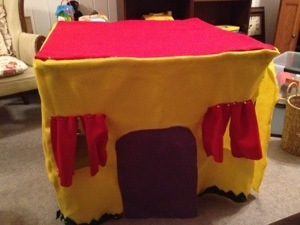 Excluding the table the materials for this project were less than $15. 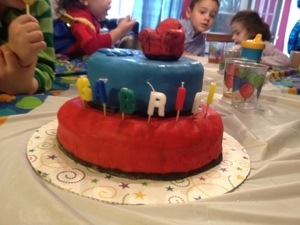 This was my first attempt at using fondant. I learned some lessons for next time like using powdered sugar to help it from sticking to the rolling pin. All in all I was happy with the results a little more time and a little more practice and I might have been ready to tackle making Blue herself. I bought the birthday balloons on Amazon. They cost less than $20 and they looked great. My favorite was the giant number 2. Me and the birthday boy! He loved his Joe shirt. I made it by taking a turtleneck using fabric glue I glued a stripe and the squares onto the shirt. Easy and cheaper than trying to buy one on eBay though if you’re not feeling too crafty you can usually find Joe and Steve shirts on eBay. 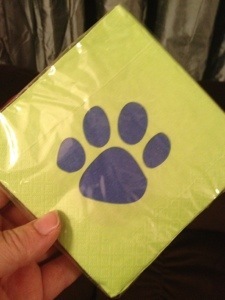 I found these napkins in the party store. 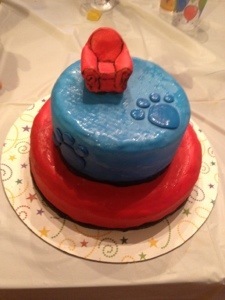 They were with a collection of dog themed party supplies and were the perfect touch. For plates I just used blue paper plates. At Buy Buy baby I found birthday candles that spelled out his name. 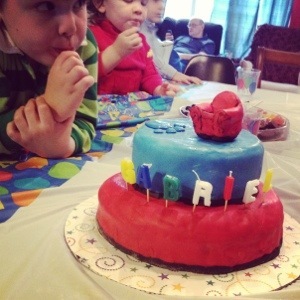 They were the perfect touch on the Blues Clues cake. I decided to commemorate this Thanksgiving with my children by making Turkey feet. 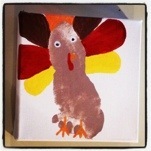 I took them to a local ceramics studio to make a platter and then on Thanksgiving I bought enough small canvases and paint to make footprint turkeys with all the kids. They turned out so cute! 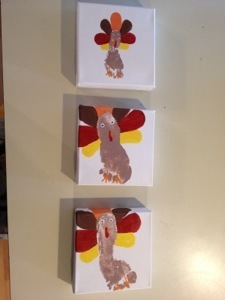 I think I’m going to hot glue ribbons to the back and string the three together to make one cute Turkey decoration. 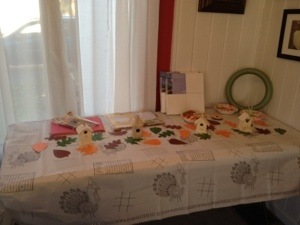 This year at Thanksgiving we set up a craft table. 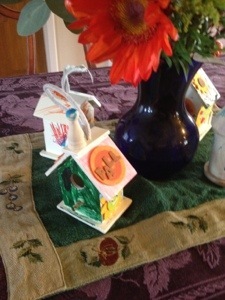 As part of the crafts I had bought $1 wooden bird houses from Michaels. 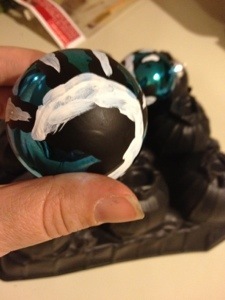 The kids had so much fun decorating these with stickers and markers. 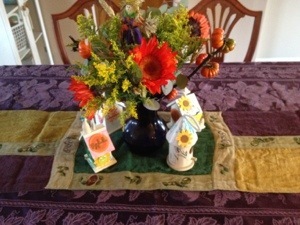 They then became part of our Thanksgiving table centerpiece. 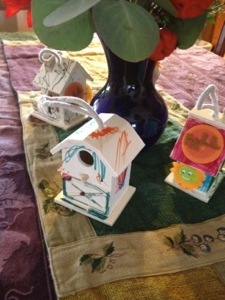 The Birdhouses then can become ornaments and the kids are super excited to hang these up on their Christmas trees. As a Thanksgiving Day activity this year all of our guests wrote what they were thankful for on paper leaves. The leaves were then glued onto wreaths and each family got to take home a wreath with everyone’s thankful thoughts on them. Such a thoughtful keepsake. I wish it was my idea but my mother was the one who lead this project. It was quick, easy, fun and everyone got a nice wreath to take home and hang next Fall. This year we hosted Thanksgiving in our new home. With 3 two year olds, a four year old and a seven year old in the house I knew we were going to have to keep everyone busy. I bought a disposable Thanksgiving tablecloth from Target that was meant to be colored on later we used the same table for the kids to eat their Thanksgiving meal on. The craft table was a big hit! 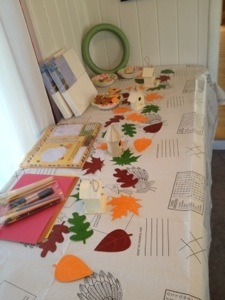 We even used some of the kids creations to decorate the adults table with. 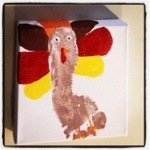 Some of our craft projects included Thankful wreaths for each family to take home, turkey footprints on canvas of each child’s foot, and the kids made pictures, decorated placemats and birdhouses, and of course the tablecloth. 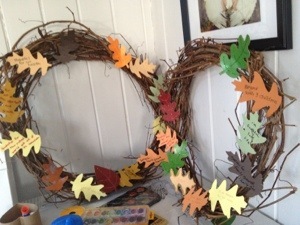 I posted directions for the Thankful wreaths, the birdhouses and the kids turkey footprints as well. 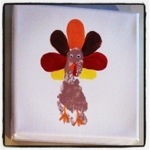 This Thanksgiving I was so excited to be serving our Thanksgiving turkey on our new platter. 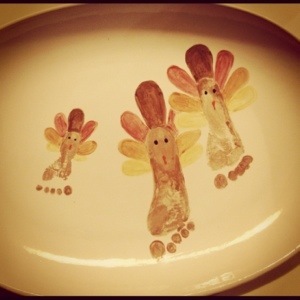 I brought my kids to our local ceramics studio and painted their feet, stapled them on a platter and turned them into turkey feet. It turned out SO cute and is definitely a great family keepsake. Every year for as long as I can remember my mom has made cupcakes for Easter. Every year as kids we couldn’t wait to decorate them. To color your coconut you just pour some in a bowl drop in a few drops of food coloring and mix it with a spoon. Roll your cupcakes in the coconut. Then take one bunny and push it down in the top center of the cupcake. We always put three jelly beans down in front of the bunny. Then take a pipe cleaner and bend it into a U for the handle. Many years we actually took the time to tie a tiny bow to the pipe cleaners. 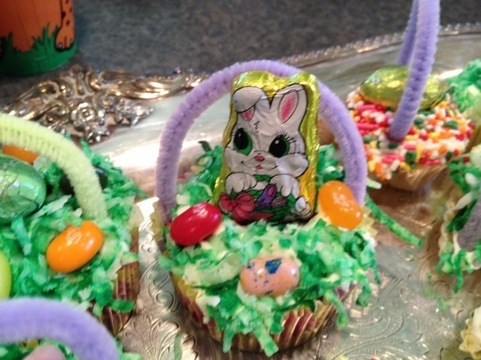 These little Easter basket cupcakes have been a family tradition for us. Something we all remembered and looked forward to every year. This year my three year old got to help grandma decorate (and taste test) the Easter cupcakes. I saw a salad recipe by Paula Dean that had fresh berries and spinach and a hot walnut dressing. You use some of the bacon grease to make the dressing. I modified that salad recipe to make mine. I bought fresh spinach at the farmers market. I started my salad off by laying down my spinach first. I had cooked bacon and let it cool overnight. I cut my bacon in small pieces and tossed most of it in with the spinach. I left a little to the side to garnish the top. I tossed in most of the berries, again leaving some to garnish. I sliced my hard boiled eggs in half and then placed them on the top. I sprinkled the remaining bacon and berries over the top. I used a raspberry vinaigrette that I bought at the store. It was delicious and easy. 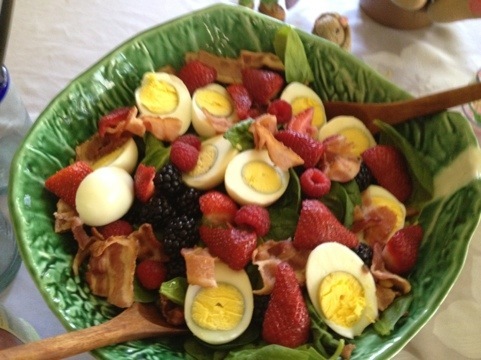 A perfect salad for Easter brunch.